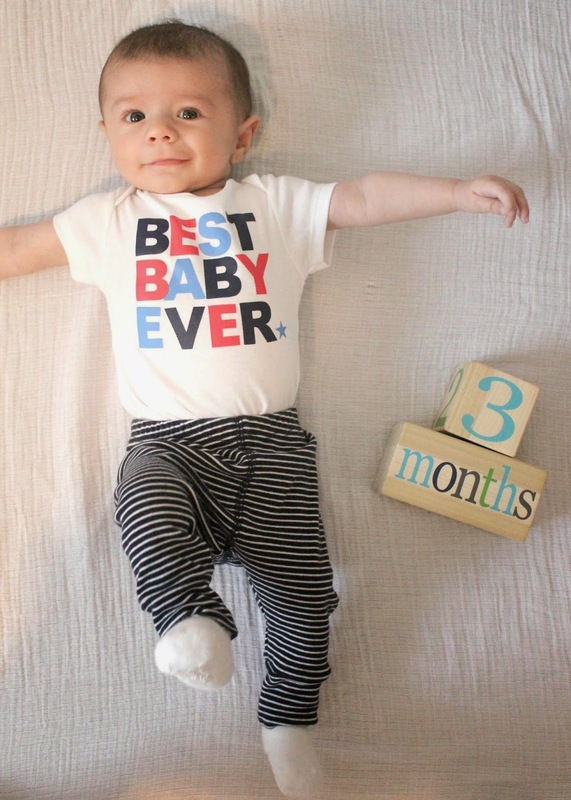 KEEP CALM AND CARRY ON: CJK: THREE Months Old! 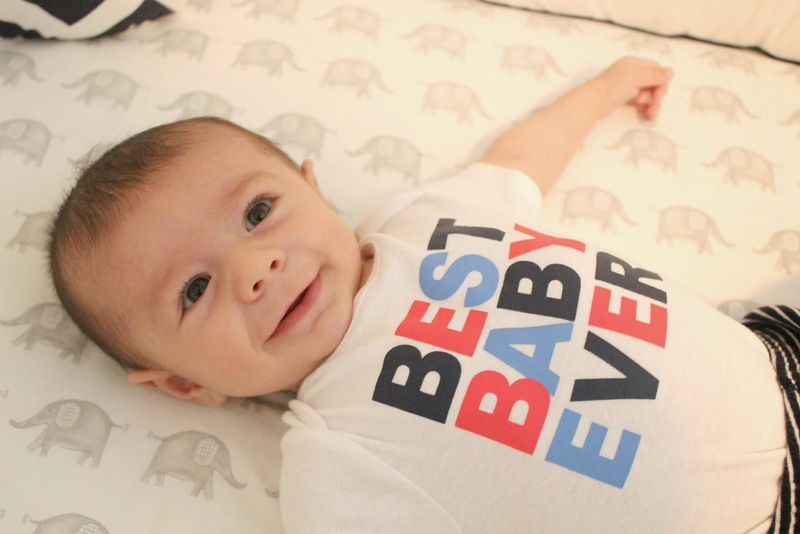 -giggles, babbles, mimics, and is always smiling! he's a boy with many different smiles-the smirk smile, the half flirty smile, the full on gummy smile! all equally able to melt our hearts in an instant. -his mommy is back to work! 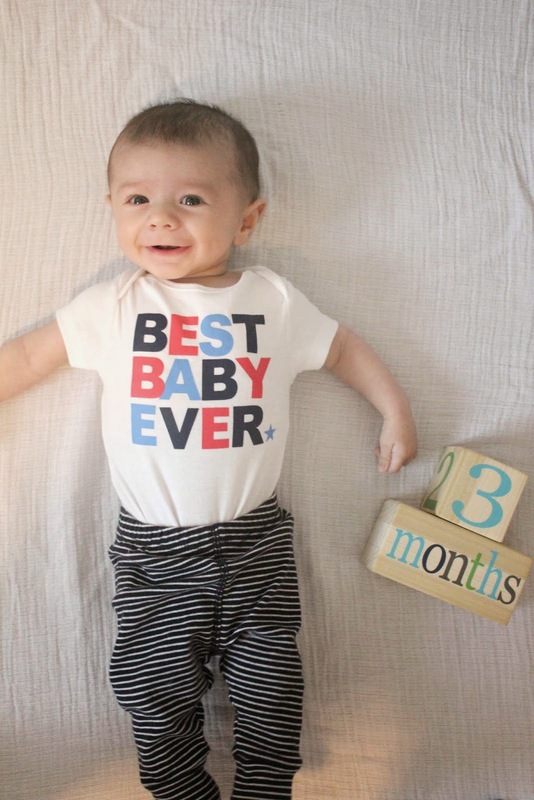 he started going to his nanny twice per week and to grandma juju once per week this month. the nanny told me he will smile at her when he's eating and that makes me so happy to hear. 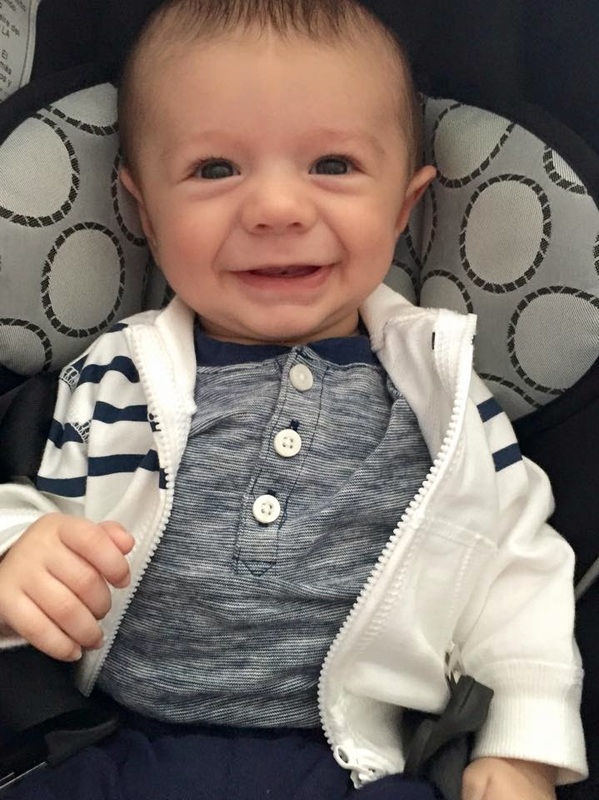 he is seriously such a sweet, happy baby! -eyes are blue on the outsides and have a little brown on the insides! 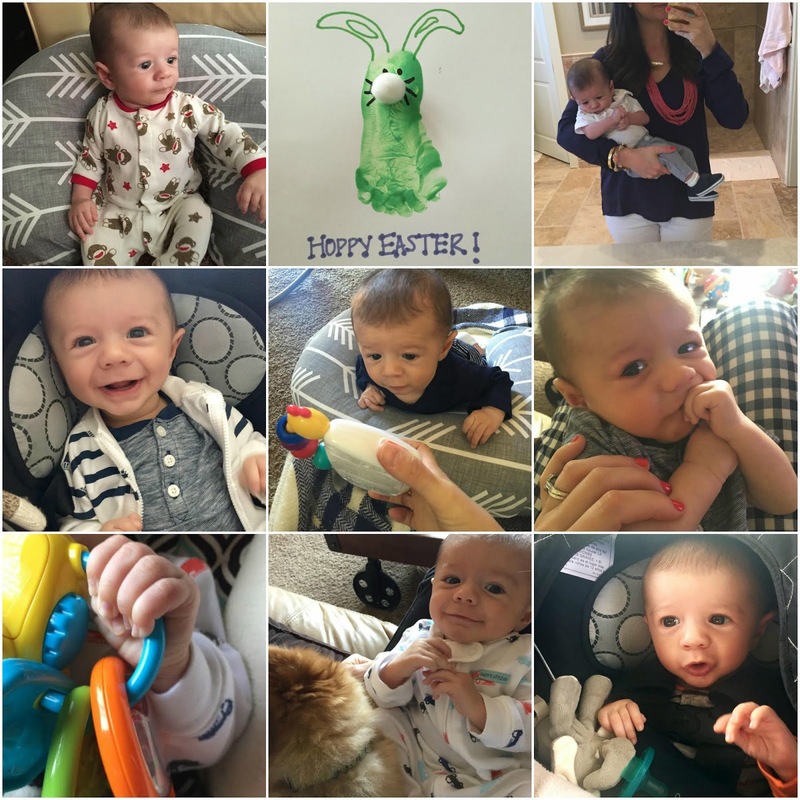 -celebrated his first Easter and St. Patrick's Day! -we didn't have a monthly pedi apt this month, so I'm not sure of his height and weight but I might stop in today to check it out because I like knowing! -it's hard to really tell what is on his "not" list, he doesn't fuss very often! 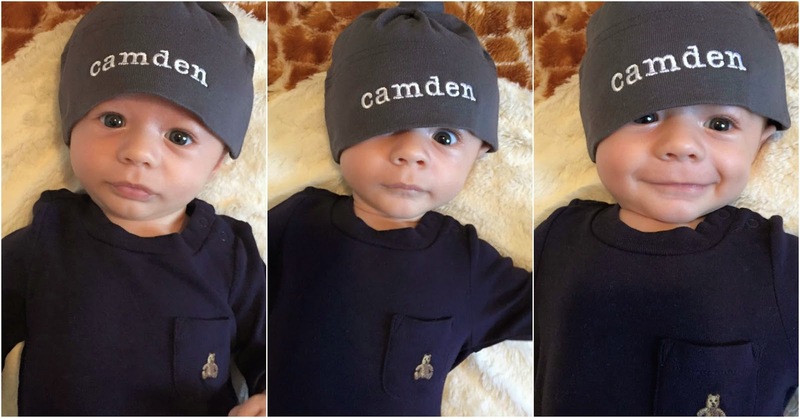 This month was a pretty big one in terms of Cam's little personality developing and learning new things! His personality is definitely starting to come out...he makes us laugh and smile SO much. Billy told me to include how much he loves me, so I guess I kind of have to, right? :) He is always watching me, responding to me, wanting to be by me, and of course I eat it up. Love love love the strong bond that we have. When new people meet him or we're out, people always comment about how he looks at me and it is the best feeling in the world. Above all else, the amount of joy this boy gives me and the pride I feel that I get to be his mom is unlike anything I've ever experienced. We love you so much Cam. So much. He is so adorable!! Love those gummy smiles, they are the best! He is seriously just the cutest ever!!! Thank you for sharing the post about it "getting easier." It seriously was so true! I always tell my husband..yes I may be getting a "full night sleep" but I don't think for the rest of my life I will ever not go to bed worrying about something dealing with our little boys (even when they are probably grown men!) Guess it is just part of being a mom :) Ps..Love Camden's smiles! So cute! He is just the cutest little guy! Love hearing about his updates. And that article is absolutely amazing. Brought lots of tears but I blame it on these hormones haha Great read! Aren't their giggles and smiles the best? I melt every time I go pick up my lil guy and he just lights up when I enter the room. 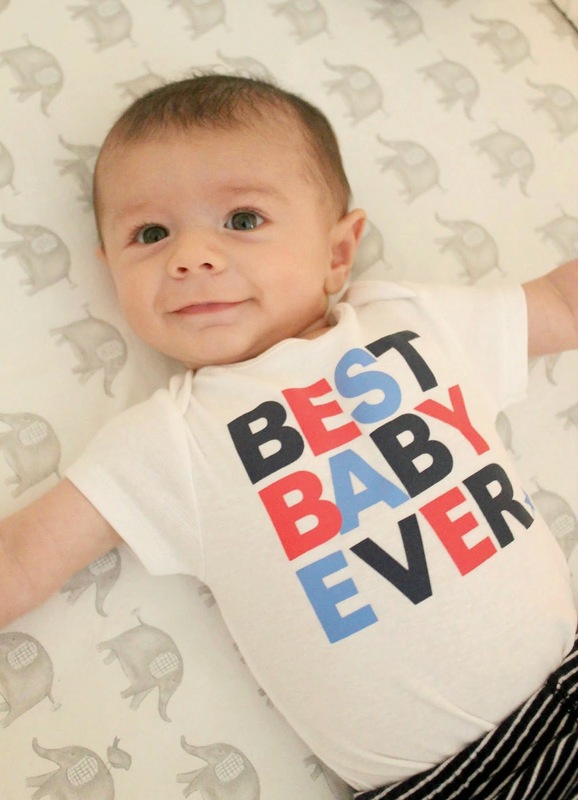 That t-shirt is too cute and so is that sweet cheesy grin he has!! I love how smiley he seems!! The cutest!